The car park at Calshot is not the most scenic place to start my walk today. I head up the B3053 and turn left into a housing estate. From the back of this estate the map shows a footpath, leading to a quiet road but it takes me some time, wandering around the estate, until I find the right path. The footpath takes me into a wooded area and I cross a wide gravel track. Ahead I can see the road, with cars passing by. I decide to avoid walking with traffic and walk down the track instead. According to my map, the track runs parallel to the road, through woods, and I should meet the road further along. But, after walking about half a mile, I come across large ‘Private’ signs. I am worried I might end up in somebody’s back garden. So I retrace my steps and walk back along the track, to find the public footpath again. I wish I wasn’t such a coward. This detour adds an extra mile or so to my walk today. Luckily the road is quiet. A few cars pass. I hear a clip clop of hooves behind me and turn round to see a woman perched on a very large horse. Her husband and children are cycling alongside her. As the road slopes downhill, the children speed off on their bikes and the woman breaks into a trot (or canter – I know nothing about horse riding). They soon leave me behind. The road continues for 3 or 4 miles. I pass several turning off to the left, private driveways with warning signs, all heading in the direction of the sea. But I can’t walk along the coast. It is all private property. So this is the famous New Forest. Not much coastal access here. I am disappointed. Finally, I come to a public road that leads down to the sea-shore. I see a group of walkers behind me – proper walkers with maps and walking poles. I stride ahead briskly. I don’t want the indignity of being overtaken again. The road is narrow and busy. Cars pass to and fro, heading for the shore and back again. There are no pavements and I am uneasy about being hit by the car and glad when I arrive at the shore. This area is labelled ‘Lepe Country Park’ on the map. There is a play area for children, set among tall pines. It is great to see the sea again. Cars are parked and people are strolling. The sun is shining. There is a cafe and I sit and drink a cold drink. Out to sea, over the Solent, I can see the misty outline of the Isle of Wight. 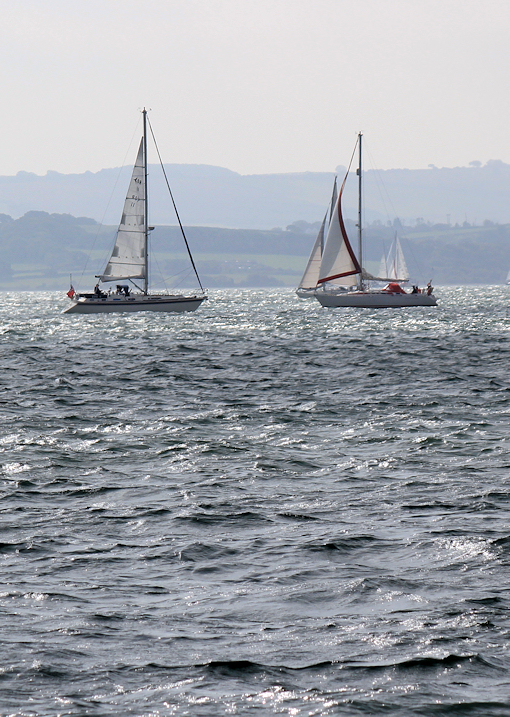 Sailing ships pass to and fro. The sun is in my eyes, in the East. The sea sparkles and the ships are silhouetted against the light. From here there is a footpath running along beside the sea wall. The tide is high and an occasional wave splashes up and sprays the path. I hold my camera against my right side to protect it. Ahead, a house juts out into the sea. This is a private residence and would make a wonderful home for an artist or a writer. I wonder who lives there and whether they ever grow tired of the view across the Solent. 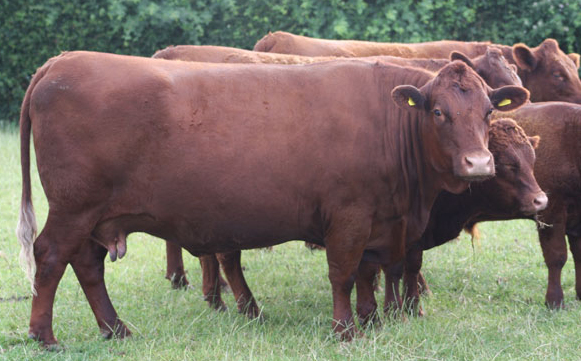 To my right, inland, there is lovely countryside with grazing cattle. A family are out walking. In the distance are the tall structures of the oil refinery and the single tall chimney of Fawley Power Station, where I walked yesterday. There is a good breeze and ships pass to and fro. 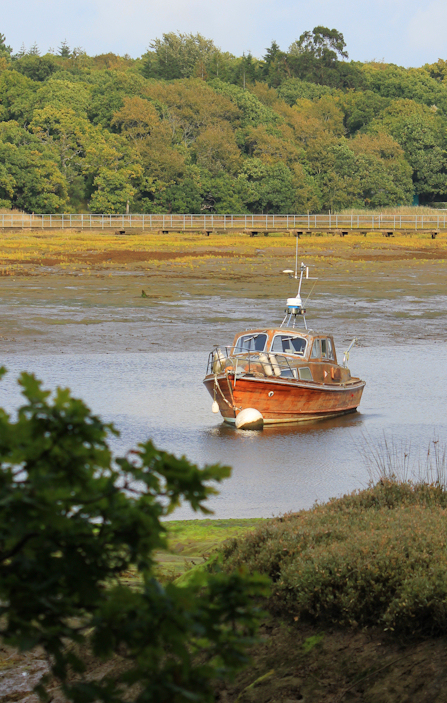 They sail close to the shore to navigate the narrow channel that leads into the mouth of Beaulieu River. I stop to take photographs. Today I have my zoom lens and am glad to have the extra freedom to choose the views I want to capture. Above me, on the gently sloping bank, I see a lighthouse above the greenery. Later I learn this is the Millenium Light House, built in 2000. 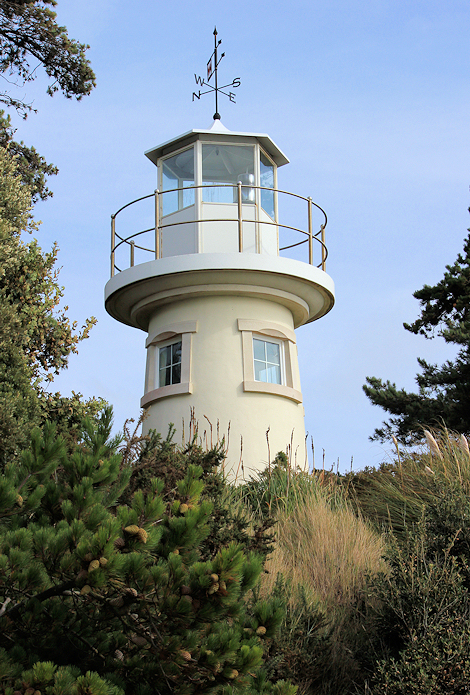 This lighthouse guides ships into the mouth of the River Beaulieu and towards the popular Bucklers Hard anchorage. Most of the land adjoining the coast is private property. I catch glimpses of houses beyond the vegetation. Pampas grasses grow along the route – a strange, foreign plant to find on the English coastline. Sadly, this is the only section of coastal footpath in the whole New Forest area. A shame. The footpath ends earlier than it should, covered by the high tide. I head up the bank and find myself on a road, yet again. I am in a surprisingly good mood. There is no traffic on this narrow country road. It is a beautiful September day. The wind is warm. I can smell the sea close by and catch the occasional glimpse of shining water through the trees. I have several great days of walking ahead of me and I feel a pinch of excitement in my stomach – a holiday feeling. 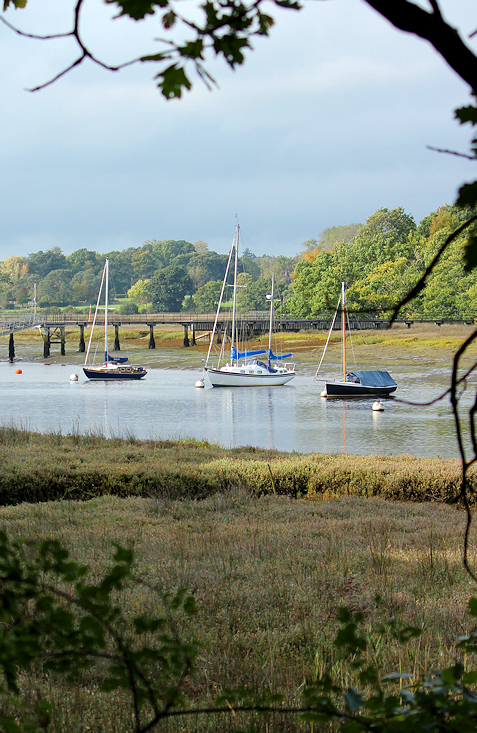 The road winds around and turns the corner, leading up beside the Beaulieu River. Well, not exactly ‘beside’ the river, there are fields and private woods between the road and the water. I reach the town of Exbury and was planning to stop here for lunch. But there are no obvious pubs. I pass an area with a steam train and consider going in – they must have a cafe. But it involves a detour off the road and I decide to keep walking. In retrospect, this was a mistake. The sky clouds over and drops of rain begin to fall. I pull out my waterproofs and pack my camera and iPhone away. Just in time. Rain falls in a steady drizzle. The next part of the walk is pretty miserable. I walk along a straight road in the rain. Traffic is heavy and there are no pavements. If caught with two cars passing me in opposite directions, I have to leap off the road and into a ditch. The road is straight. I am confined by trees. The grey rain falls around me. Sometimes during my walks – not often, but sometimes – I wonder why on earth I am doing this. What possessed me to start walking? And why have I continued? And what is the point of it all? This is one of those days. I am walking along a boring road, in the dripping rain, dodging traffic. I am hot under my waterproofs, tired and hungry and nowhere near the sea, heading inland. What is the point to it all? I think of other things and keep walking. I think of lunch and keep walking. I think of books I have read and music I have heard. I keep walking. Suddenly, I reach a place called Otterwood Gate and the scenery opens out. There is a car park and I sit on a tree trunk and eat a snack. Heathland stretches ahead of me and I can walk along a wide open patch of green grass by the side of the road. In the distance I see horses. Far across the heath are the tall chimneys of Fawley Oil Refinery – hidden from sight when I walked along the perimeter of the plant, but now obvious across the open heathland of the New Forest. And ahead of me is a pub. I hope it serves late lunches. When I reach the door, the way inside is blocked by a group of donkeys, sheltering in the lee of the pub to avoid the rain. I walk gingerly around behind them (is it true that donkeys kill hundreds of people each year?) Inside is dry and I enjoy a rest, a large glass of cider and a meal. By the time I have finished eating, the rain has cleared. When I set off again, the donkey’s have moved from the door. A couple of adults are attempting to persuade a young child to stroke one of the beasts. He looks, understandably, rather doubtful about the enterprise. I walk down the road and into Beaulieu. There is a green space by a large tree with horses standing by the river and a few tourists taking photographs. 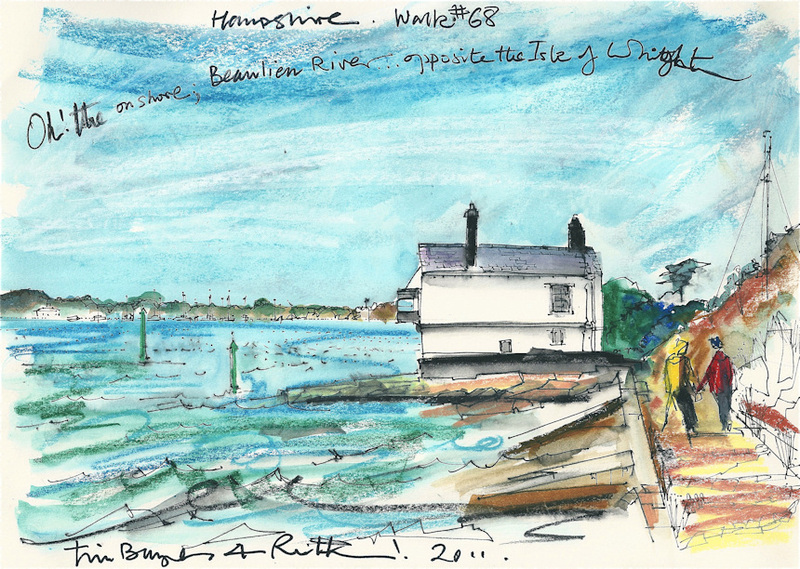 The tide is out and Beaulieu is not at its best – with not enough water in the river, too much mud and stranded boats. From now on the sun starts shining – low in the sky and lighting up the trees with a golden glow. I walk back along the other side of river, heading towards the sea, through woods. This route is popular and there are plenty of people around. The leaves are just beginning to turn. The tide is coming in. The boats start moving about on their moorings as the water in the river rises. I walk past families, couples, young children playing in the mud. Men admire my camera. And, finally, I arrive at Bucklers Hard. This really attractive area has a pub that sells cream teas. They apologise – they have run out of butter. I don’t mind. Clotted cream will be fine with the jam. Who needs butter? I sit out in the late afternoon sunshine and enjoy tea and scones. There were two disappointing things about today. Firstly, the lack of access to the shore because of private property and no public footpaths. If the New Forest wants to maintain its reputation as a tourist destination, it really needs to do something about this. Secondly, my Trip Journal app froze up yet again, kicked me out, and then told me I had only walked two miles and I lost all my iPhone photographs of the walk. So I decided to keep it switched off for the rest of this holiday. That will teach it! Do donkeys kill many people each year? This entry was posted in 07 Hampshire and tagged hiking, photography, travel, walking. Bookmark the permalink. I am also walking round the coast and have just completed this leg. Like you I found the road walking tedious but at least I did it in glorious sunshine. I quoted from your blog in my account. Good luck in Scotland – I began at Gravesend n Kent and have only just reached Dorset. 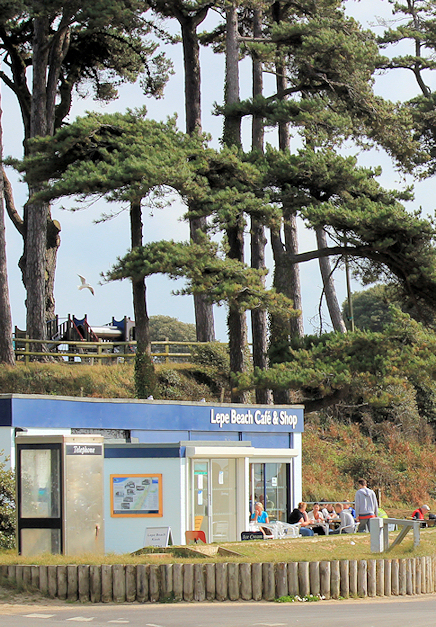 Could you have walked right along the beach from Calshot to Lepe? It looks on the map as though it’s possible and you would have seen Luttrells Tower and the famous (at least locally) Lepe ‘Dolphins’…..not Dolphins at all but structures (part of the pier heads) left in the water from WW2. I have a photo of them, I’ll add a link https://www.flickr.com/photos/finlap/34430188451/in/photolist-UstHuP-UpGkMd/ I hope it works for you. There’s lots more of the history in the description under the photo. I hope a link doesn’t make this go into your spam folder! I am forgetting things again! I am wondering why the Solent Way comes so far inland from Hythe to Beaulieu before going along the coast to Lymington and Milford? I hope you got the link in my post above. 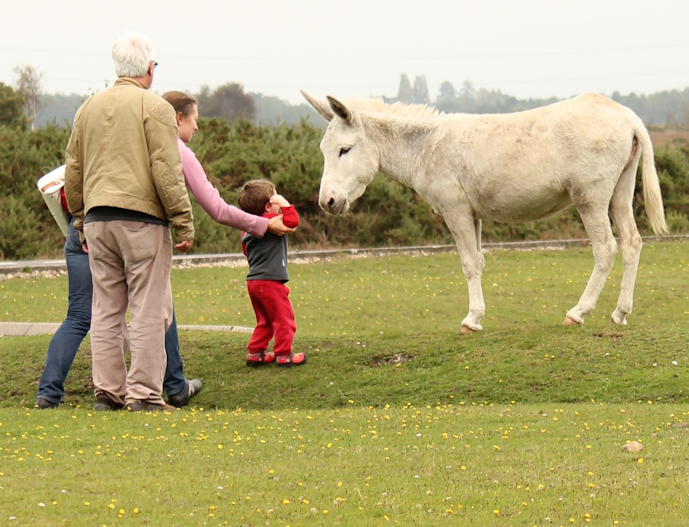 Oh, btw New Forest donkeys can be quite stroppy, and getting children to stroke them isn’t sensible though I see tourists doing it all the time – and getting their toddlers to sit on the backs of both donkeys and ponies. When I’ve said anything I am met with a frosty ‘mind your own business’ glare. Sorry about the three posts on one of yours! Lovely to have your posts, Karen 😄 Thanks for the link, very interesting. I believe the Solent Way comes inland because the Beaulieu estate refused access through its land. I’m wondering what will happen with the route of the new England Coast Path.